We are converting our Tesla Roadster to use the J1772 standard inlet. The Roadster was produced before the standard was established, so has a different physical connector. The electrical protocol for the "pilot" signal is the same, so it would seem to be a simple matter of just replacing the physical connection device. Except... the J1772 standard uses a "proximity switch" to alert the car when it's about to be unplugged. When this happens, the car has a very brief amount of time to stop pulling power. If the car is continuing to pull power when it is unplugged, it can cause arcing and potentially damage the contacts. The original Tesla connector solves this problem by cutting the pilot signal when the connector is unlatched, so the Roadster detects the loss of the pilot signal as a trigger to stop charging. We have successfully converted the car to use a J1772 inlet and have charged from numerous J1772 stations. Each time, we're careful to stop charging manually (at either the station or on the car's touch screen), but we'd like a more robust solution so that we don't risk damage if someone else unplugs the car. Goal: Use the J1772 proximity signal to detect when the car is about to be unplugged, and cut the pilot signal. Electric Vehicle, in this case, the Roadster. 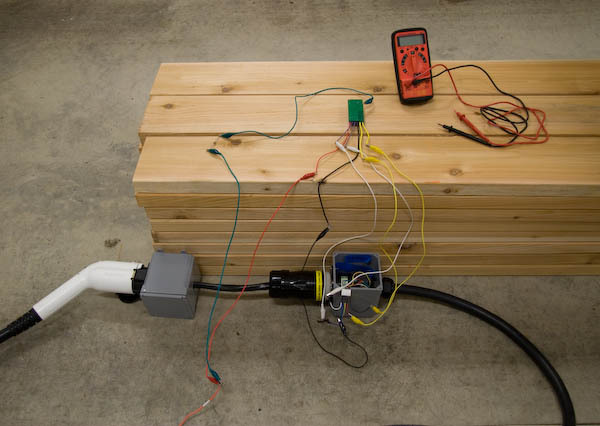 Electric Vehicle Supply Equipment, also called a charging station; this is what is connected to 120V or 240V AC and provides power to the car for charging. EVSEs use the J1772 standard. The standard mechanical and electrical protocol for EV charging. It specifies the physical connections and the communications -- pilot signal and proximity signal. The specification can be purchased from SAE. This is a signal generated by the EVSE and used to communicate between the EVSE and EV. This signal is a 1 kHz PWM generated by the EVSE at -12V to +12V. The EVSE tells the EV the maximum amount of current available via the PWM duty cycle. The EV indicates that it's attached by connecting a diode and a resistor; this reduces the amplitude of the positive side of the wave. 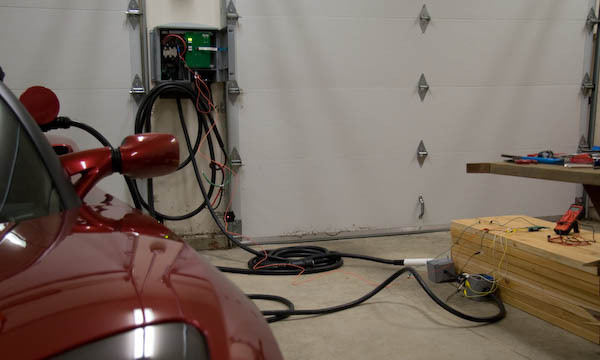 When the EV wants to start charging, it changes the resistance to further decrease that amplitude; the EVSE detects this lowered voltage and provides power on the appropriate lines. This signal wire tells the EV when the connector is about to be removed. The connector has a latch that holds the connector in the inlet. When that latch is released, the signal wire resistance changes. This resistive load is connected to ground, so the EV can determine the proximity signal state by adding a pull-up to +V and measuring the voltage on the proximity signal line. A component that will switch an output load on or off. Form B relays are Normally Closed, which means that the output pins are connected when idle and are disconnected when the relay is energized. To disable the load/output for a Form B/NC relay, we apply voltage across the relay's inputs. Here's a summary of the changes that happen to various signals during the charging process. The EVSE connector is inserted into the EV's charge inlet. The car asks for power by adding resistance to the pilot signal. Someone releases the latch in order to unplug the car. This is where we need to react to proximity signal and disconnect the pilot signal from the car. We decided to get power from the EVSE. When the car is charging, we can tap into the 120 V or 240 V supply to power our device. But, when we're first plugging in, there is no power available. It doesn't appear until the car asks for it, and the car needs the pilot signal in order to do this. This means that we need to be sure that the pilot signal is always passed through when we don't have power. We're using a Form B relay. The two pilot signal wires will be connected to its outputs. This will let the pilot signal through when our circuit is disabled (no-power state until the car starts charging). When the proximity switch is opened, we'll energize the relay, which will result in the output being disabled, cutting the pilot signal. When the pilot signal is interrupted, the Roadster will know to stop charging. Also, since the car's diode and resistors have been removed from the pilot circuit, the EVSE will interpret this to mean that the car has been disconnected. Both of these conditions will trigger current to stop flowing in the charge circuit. But, when the EVSE cuts power, our circuit loses power, too! After we lose power from the 120/240 V supply, we still need to power the relay circuit for a brief period in order to keep the relay open (pilot signal interrupted) while the connector is fully removed. We're using a capacitor to provide this power. When the proximity switch is opened, the voltage measured on the proximity signal will rise. We detect this with a comparator (using an internal reference voltage and a nice wide hysteresis band) and use the output from the comparator as an input to the relay. We tested it with an oscilloscope to ensure that it was reacting as we expected. We were hoping that at startup, the output from the comparator (pink) would closely match the input supply (yellow). If the comparator didn't supply a high enough output, it would trigger the relay and interrupt the pilot signal. 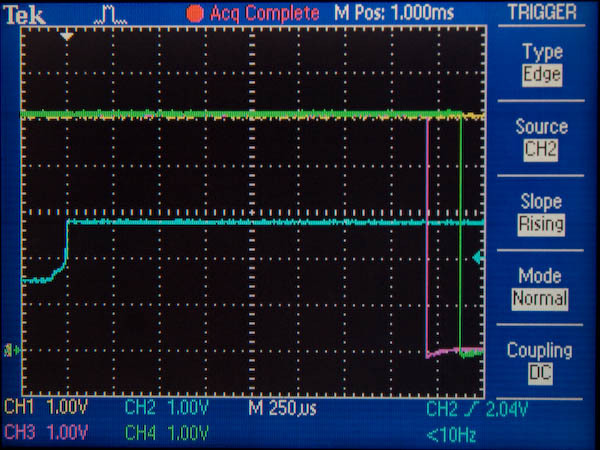 The results were beautiful, including a nice steady connection through the relay (shown by the green trace). The blue trace is the proximity switch voltage. This screen shows the result when the J1772 connector's latch is pressed. The blue trace shows the proximity switch voltage changing when the switch is opened. 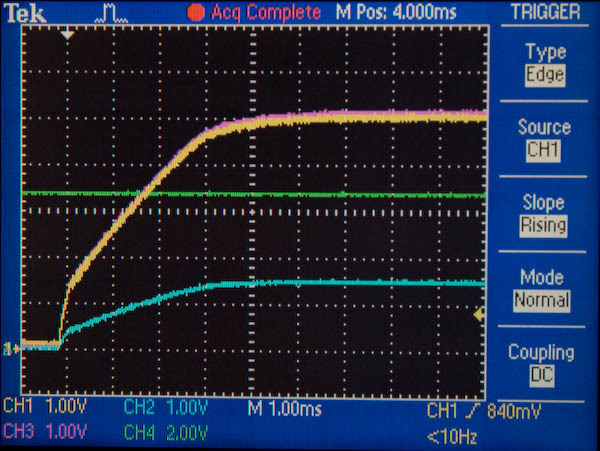 It's just under 2 ms before the comparator (pink) reacts, which it does with a nice sharp change, and then only about 200 μs until the relay has opened (shown by the change in the green trace). After we were satisfied that the circuit was working as intended, we hooked it up to the car and EVSE. It started charging just fine, and stopped when we pressed the release button on the J1772 connector!